Getting your ideas implemented is as easy as frying an egg. Deploy Anywhere Because Lektor builds out 100% static HTML you can deploy them to any host (including S3, GitHub Pages, any web host, etc.). Cross Platform It runs on Linux, OSX and Windows. 100% File Based All source data is well structured and can be tracked in a version control system or cloud storage like Dropbox. Flat-File Database All source data is stored in a flat-file tree database and can be freely queried. The layout of that data is completely configurable. 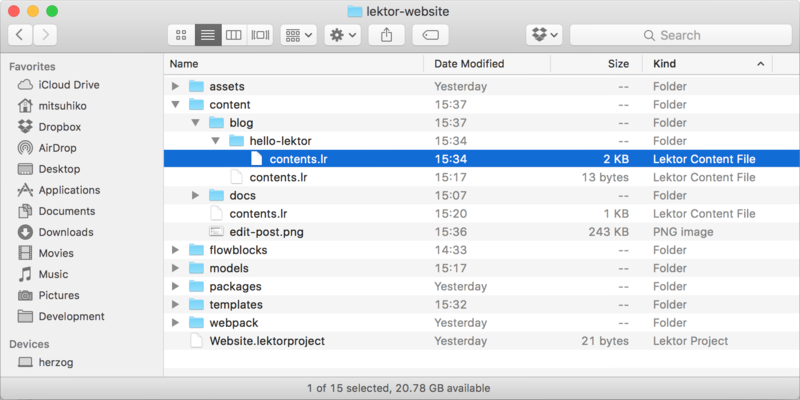 Customizable Admin Lektor comes fully equipped with a flexible and beautiful admin interface so you can edit your pages without having to touch the raw sources. Dependency Tracking The build process intelligently tracks page dependencies such that it only rebuilds pages that have changed. Image Tools Create thumbnails and give convenient access to EXIF data. 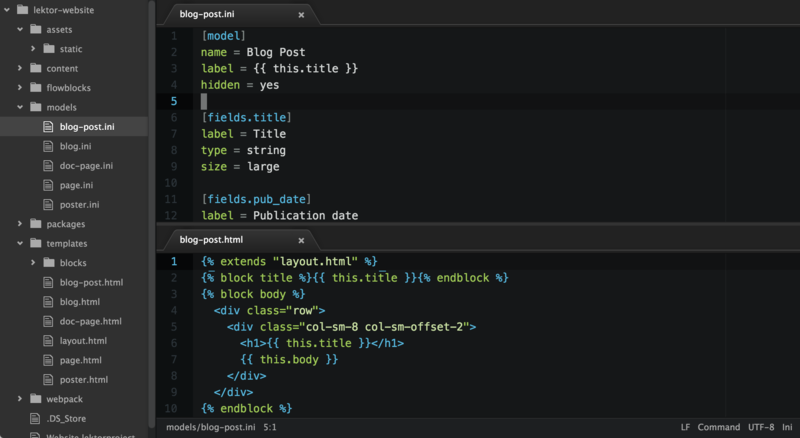 Plugin System Lektor supports loading plugins that can customize a wide range of functionality. Python API The build system is written in Python and provides a documented API to extend it and integrate into other apps. Multilingual We can speak multiple languages and allow you to easily create localized websites. 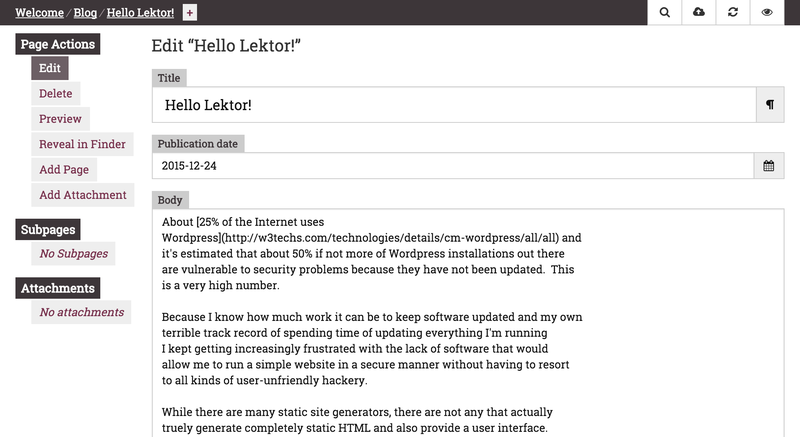 Lektor comes with a customizable admin panel that allows anyone to create and edit pages. The project files are neatly laid out in the filesystem and allow tracking via cloud storage like Dropbox or version control. Projects can be immediately published to remote servers from the admin panel. Changes become immediately visible as Lektor rebuilds on demand. A preview is also embedded in the admin interface. The structure of the pages and the templates used to render the page can be completely customized. 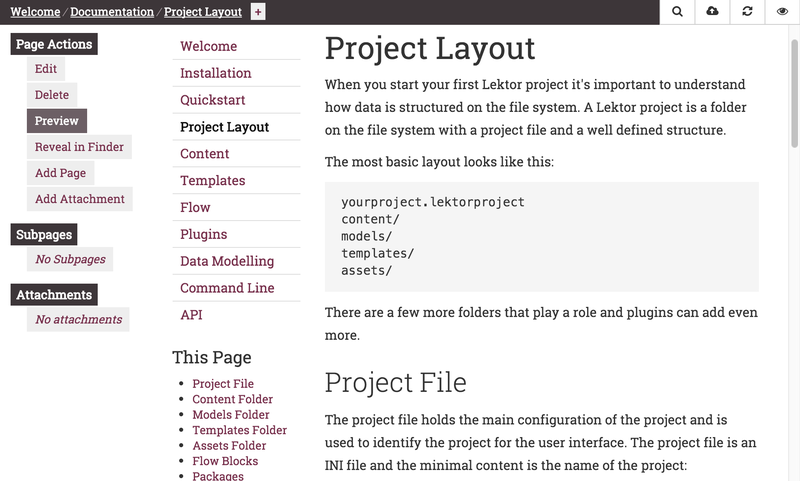 Lektor at its core is a three clause BSD licensed Open Source project written in Python and Node.js.